The event that I’m involved in for Waterford Writers’ Weekend 2013 is on the day after tomorrow. It’s a panel discussion on the topic of Making Social Media Work for You and it’s on Friday March 22nd, 1 -2 PM, Greyfriars, Waterford. One of my fellow panelists is Catherine Ryan Howard, Ireland’s most successful self-published author and a master of using social media for promotion. The event is relevant to anyone who uses social media in their work – small business owners, employees, and arts professionals of all hues. You can book your place here. OK, shameless plug over. Time for the latest of my reviews of venues to visit in Waterford over the festival weekend. Food and drink: A fairly standard menu of sandwiches, panini, salads, breakfasts and desserts. The quality of the food is good, most items are home made and there are gluten-free and dairy-free options. Salads are imaginative and change daily. The coffee is very good. The breakfasts are ideal if you’re in town first thing in the morning – I like the two-egg omelette breakfast with two rashers, two sausages and two slices of toast. There are child-friendly options in the form of cartons of juice (as all parents know, the least messy child’s drink when you are out) and cookies, though the cookies are over-priced, as they are everywhere (they’re only big biscuits!). Service: Table service. The staff are very friendly and helpful. On festival weekends, the cafe people set up a stall by the main door of the theatre (which is at the side, a little confusingly if you’re new to Waterford) selling sweet treats and coffee, to save you climbing the stairs. Layout and accessibility: This cafe is all location, location, location, and in more ways than one. Firstly, it’s on the first floor of the Theatre Royal, the former Georgian playhouse that today houses Waterford’s beautiful, best-known theatre and is one of the main venues for Waterford Writers’ Weekend. There’s a treat in store for art lovers on the way up the stairs: the walls are lined with a selection of pieces from the Waterford Municipal Art Collection. Among them is an all-time favourite of mine, the wonderful Curiosity by William Conor. Secondly, grab a window seat if you can, because this cafe has the most historic view in Waterford city. Right across the street you will see the Irish tricolour fluttering in the breeze. The building from which the flag hangs marks the spot where the tricolour was first unveiled by Irish revolutionary Thomas Frances Meagher in March 1848. This event is now celebrated every year in Waterford by the 1848 Tricolour Festival. Thirdly, stay in that window seat, especially if you have an interest in architecture, or just like looking at beautiful buildings. The cafe overlooks part of Waterford’s Viking Triangle, including the Bishop’s Palace, home to the Georgian collection of the Waterford Museum of Treasures – a fantastic place to visit, whether you’re local or a visitor – the House of Waterford Crystal with its eye-popping window displays and, if you crane your neck, the Waterford Medieval Museum, a recently added architectural delight. The Mall, an elegant, tree-lined Georgian street, also lies stretched out below. As for accessibility, the cafe can be reached by lift. There is just about enough space between tables for a buggy or wheelchair. The tables are set back a little from the door so you have space to stop and look around when you go in. Parking: There are a few on-street parking spaces on The Mall, directly outside the theatre, but they are almost always full. Instead, head to Catherine Street, a two-minute walk, or Waterside, a four-minute walk, where on-street parking is more plentiful. Alternatively, park in the Bolton Street car park, a two-minute walk. This car park has no daily limit, so you can leave your car there as long as you like. Charges: €1.80 per hour. As I mentioned in my last review, if you’re planning to head to several festival events over the day, park in the private car park just off Thomas Hill (head up the hill, follow the street around to the right, entrance is on the right) for €5.00 a day flat rate. 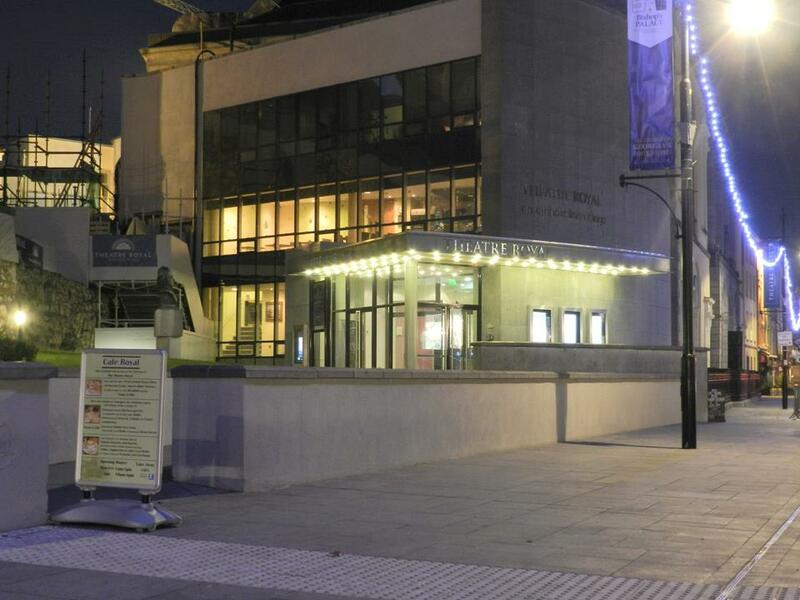 Accessibility to festival venues: The Theatre Royal is one of the main venues at Waterford Writers’ Weekend. Other festival venues are a maximum of five minutes’ walk away. Posted on March 20, 2013, in Waterford, Writing and tagged theatre royal waterford, waterford, waterford writers, waterford writers weekend, Writing. Bookmark the permalink. 5 Comments. 1 minute away from the Cafe. Sunday’s free parking in front of the Cafe. Thank you, we appreciate taking your time and writing this nice review, yes we are aware of the changing table, we will get one as soon we get the go go from the theatre administration. we have extended our gluten free menu with 2 savoury Gluten free quiche made every day, and added a hot and a kids special. Or you can park in Tesco for free for two hours. Highly recommend. Just wrap the child up warm! You mean the Poleberry Tesco Derbhile? That’s around a 10-minute walk. I suspect that may be too far for most drivers, despite the handy free parking (though strictly speaking it’s for Tesco customers and word has it that clamping does happen there…). Yeah, I can see it wouldn’t be an option for everybody.